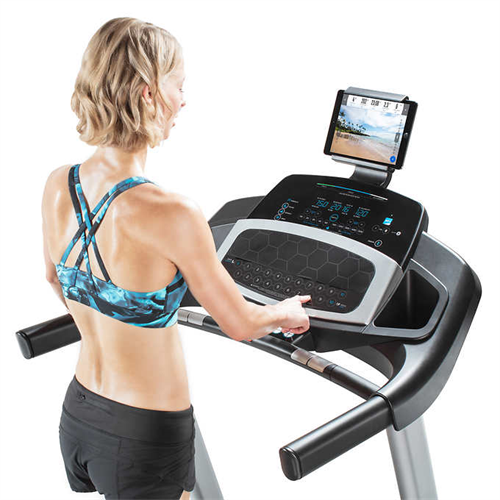 Find the strength you’re looking for in a workout with the ProForm® Premier 500 Treadmill. A lifetime frame warranty and 25-year motor warranty combine with 20 on-board workouts for a piece of exercise equipment that was built to last. This iFit® Coach Ready™ treadmill lets you work out anywhere in the world through Google Maps™ Street View and a membership. When you’re finished with your workout and want your living space back, SpaceSaver®allows you to fold up the treadmill and store it out of the way. Start your workout habit right with a motor delivering smooth, consistent power to your full range of workouts—intervals, speed, and endurance. Because your in-home workout experience should be a comfortable one, ProForm® designed a roomy deck so you won’t feel confined as you walk, jog, and run. The 139.7 (55-inch) length gives your legs plenty of room to get moving. And the 20-inch width allows your upper-body comfortable elbow room. To ensure our treadmills are top quality, we test each belt for one million cycles at double the user weight before release. We know when you’ve made up your mind about getting fit, you mean business. So we made sure your workout stats are right in front of you as you work out. That means you can watch your mileage, speed, calorie burn, heart rate, and time add up. Built with the whole family in mind, the Premier 500 treadmill accommodates up to 136 kg (300 lb.). We know you like your house to be clutter-free. So we invented a treadmill that folds up and out of the way when you're done with your workout. It totally rocked the fitness industry; but honestly, we're just glad you don't have to sacrifice your living space for your fitness habit anymore. Not everybody likes to run at 10 miles per hour. But it’s nice to know this treadmill can totally handle it. Thanks to a bigger motor size, we are pretty proud of this machine’s 10 mph top speed. Our in-home efficiency booster means you can run every day without using excessive amounts of electricity. And the convenient QuickSpeed® buttons let you adjust your intensity instantly, so you can stay focused through every step of your workout. We consider incline training the treadmill game changer—you can realistically condition your body for those challenging uphill routes. 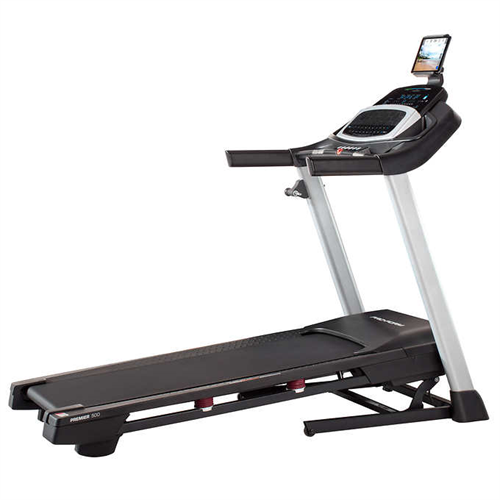 The Premier 500 offers powered, automatic incline adjustability. When you train with incline, you know you’re giving your legs the best workout possible on a treadmill. Enter your weight, calorie burn rate, workout time or calorie goal and the treadmill will do the rest. You choose how many calories you want to burn in a specific time period. This treadmill also features a calorie burn rate meter that ranges from "Health", "Fitness", and "Performance." We know that a quality product is all about the details. That’s why we’ve built the Premier 500 with 1.9-inch precision-machined, balanced, non-flex rollers. These medium-sized rollers decrease tension, which keeps wear and tear to a minimum. You’ll also notice less noise and better grip. Make fitness time multi-tasking time. This device shelf keeps your tablet secure and conveniently close so you have access to all your training tools and entertainment must-haves. Tablet not included. Have you ever wondered what it’s like to run in Barcelona? Just press start. Download a Google Maps™ route or create your own. 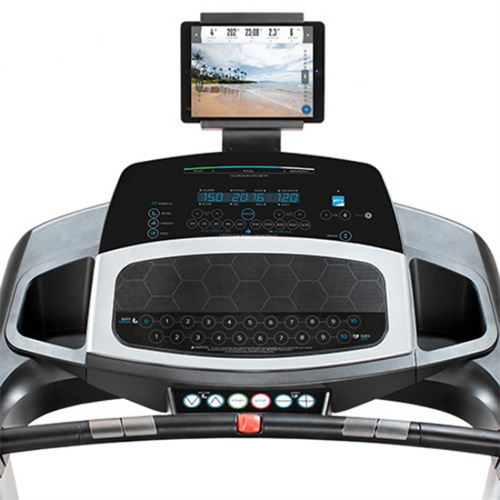 This iFit® Coach Ready™ treadmill automatically adjusts the incline to recreate trails from Mongolia to Ecuador. Customize your training with unlimited workouts designed by certified personal trainers. This ever-growing workout library offers programs that progress with you from beginner to marathoner. Subscription required. Access iFit® account from computer, tablet, or smartphone. Requires membership, sold separately. Trademarks and trade names are those of their respective owners. Google Maps™ is a trademark of Google, Inc. Syncing iFit® account from tablet to machine currently on Android™ and iOS tablets only. Tablet not included.